“The age of such vessels, the wear on reactors, and examples of other mishaps aboard ships of Russia’s nuclear icebreaker fleet are a cause for concern to Norway’s public and the population of those countries the Rossiya will also pass,” he said. A recent example was a fire aboard Russia’s Vaygach nuclear powered icebreaker, which killed two in December 2011. A third man suffered burns and smoke inhalation, but the Vaygach eventually returned to Atomflot under its own steam. The Vaygach put to sea in 1990. As loss of cooling systems was the primary cause for the disaster at Fukushima, the Taimyr’s coolant mishap was treated seriously, and with an uncharacteristic degree of openness by Russian officials that worked to return the ship to port, particularly the Emergency Services Ministry. The coolant loss had caused increased radiation levels in the reactor room of the Taimyr, and upon visual inspection, a hole, which was leaking some 20 to 30 liters of cooling water a day, was discovered in the welding, a highly placed source within Atomflot, told Bellona at the time. The cause of the was thought to be either metal fatigue, faulty welding or both. The Taimyr, like theVaygach, was working in the Yenisei Gulf on the northern coast of western Siberia in the Kara Sea when the coolant leak was discovered. The 23-year-old Taimyr was able to return to port under the power of its diesel generators after the reactor was shut down, and was escorted back into port by two other icebreakers, the Yamal, and the Rossiya itself. In an effort to allay fears of any ongoing radiological leaks, Atomflot officials held a press conference aboard the Taimyr when it arrived back in Murmansk harbor. And in 2005, the 50 Let Pobedy – or 50 Years Victory, Russia’s newest icebreaker – caught fire in 2005 at the Baltiisky shipyard while still under construction. No radiation releases occurred as no fuel had been loaded onto the ship. The vessel also caught fire while under construction in 2004. The keel of the 50 Let Pobedy was laid in 1989 and it was floated at the end of 1993. But due to the lack of financing, construction was suspended. It is now currently part of Russia’s fleet of nuclear icebreakers. “Of course it is sad. The vessel is still ‘alive’ – all technical equipment still works and maintenance and repair have been managed on schedule,” said Spirin in his broadcast remarks. It is still uncertain when Rossiya will be laid up and what further plans there are for its dismantlement. 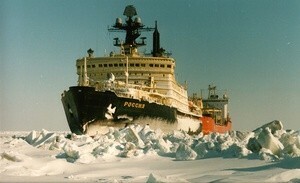 The Rossiya is the world’s fourth nuclear-powered icebreaker and in 1990, it became the first Soviet vessel to take foreign tourists to the North Pole. The Rossiya has also made the journey to the Gulf of Finland before, in 2011, when it was dispatched there to help with commercial navigation during an unseasonably cold winter. During that time, the Barents Observer reported, it helped free 58 vessels that were locked in the ice.